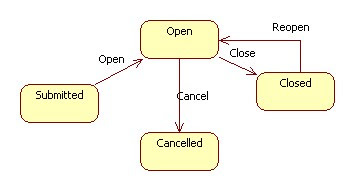 I always found state machines very useful for describing particular aspects of object behavior. A classic example can be a shopping order: it can be "pending","in progress", "shipped", etc. In my previous project, I started with a simple design using a transition matrix. I must confess it didn't work well. It was hard to explain and it grew more complex as new requirements were added. I though it would be simpler if I didn't use any "fancy OO stuff" and advanced idioms. I've should know better! This time I wanted to try something different, and based in my previous experiments with internal DSLs with Scala and my (very limited) knowledge of the patters to achieve that in java, I just went ahead and tried to come up with something useful and understandable. This time seems to be working: although it has some "magic" behind curtains is only in the creation and is very easy to add or modify the configuration class for new or updated states and events. Other members of my project were able to add and remove states and transitions with only a brief explanation. The basic classes are pretty simple: State and Event. * @return Returns the label. * @return Returns the transitions. * @return Returns the event. * @return Returns the origin. Doesn't seems too complex, right? Interesting, but can you add a (pseudo) unit test on how you use these classes to advance through the state machine. That is not clear to me. You're right, the usage is not really clear. In my definition of state, sending an event with an undefined transition, just keeps the same state, but you can throw an exception too. Great, one more question. Where do you do the actual 'work'? Normally, you would want to do something in a transition or in a state I guess? I didn't worry about "Work" because in this case the FSM was just to provide a skeleton to enforce the correct transitions. on doEvent, you need to invoke "newState.action.execute()".